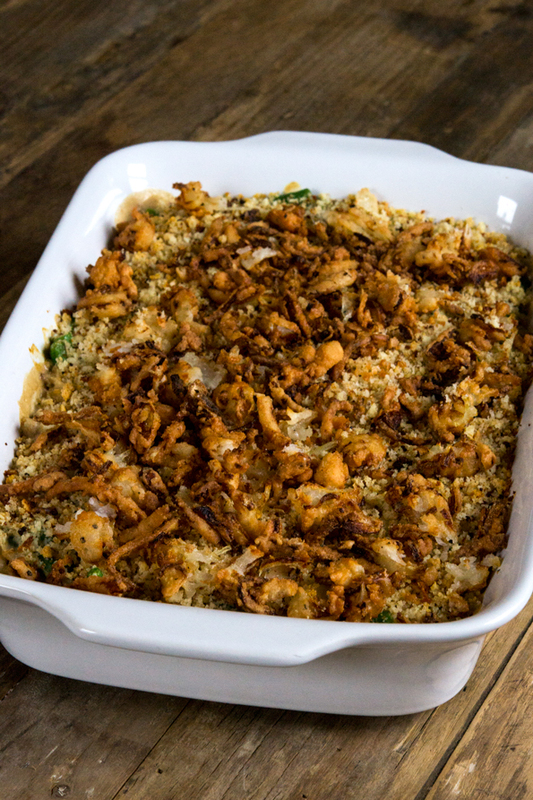 Gluten Free Green Bean Casserole | Great gluten free recipes for every occasion. Easy homemade cream of mushroom soup is the secret to the perfect gluten free green bean casserole. Make your Thanksgiving table better than ever this year with crisp-tender green beans, cream of mushroom soup and homemade crispy onions. They totally make gluten free cream of mushroom soups these days (Progresso and Pacific come to mind). But, personally, they’re just not my speed. And anyway if you’re gonna make your own gluten free crispy fried onions, shouldn’t you just go ahead and make a simple gluten free roux and your own cream sauce? It’s so, so easy, and it’s good practice for making gluten free gravy (it’s all basically the same technique). 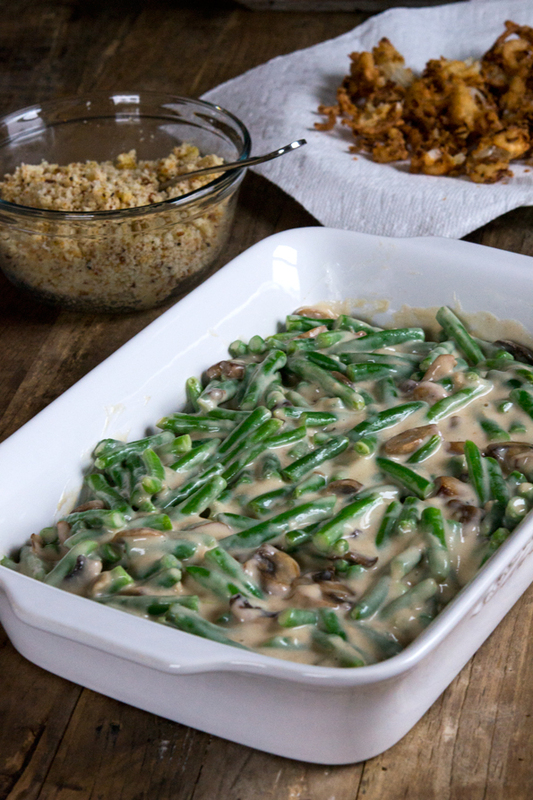 Let’s make the Gluten Free Green Bean Casserole to end all Green Bean Casseroles. We’ve got work to do, friend. Do you know there are people who think that gluten free food is terrible? Let’s school them. You don’t really have to make your own gluten free bread crumbs. But I always take the odds and ends of whatever gluten free bread I have lying around and make some fresh bread crumbs. They keep so well in the freezer. And the price of buying gluten free bread crumbs is an absolute crime. I think, ounce per ounce, it’s more valuable than gold. And for no good reason. 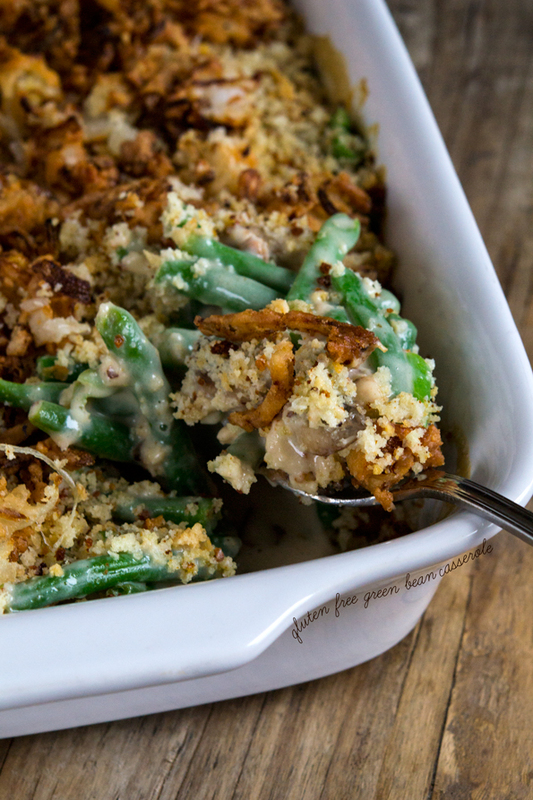 The firm but tender fresh green beans, along with the fresh mushroom cream sauce, topped with easy homemade bread crumbs and, of course, sweet and crunchy fresh gluten free crispy fried onions (the real star of the show), make this the Green Bean Casserole to beat. Happy almost Thanksgiving! Don’t forget to read the directions below for making the more time-consuming parts of this recipe at least 2 to 3 days ahead of time. Preheat your oven to 375°F. Grease a 9-inch by 13-inch baking dish, and set it aside. First, blanch the green beans. Bring a large stockpot of salted water to a boil, and add the prepared fresh green beans. Boil until the beans are bright green and almost fork tender (about 3 minutes). Drain the beans of the water, and scatter on clean paper towels to drain. Blot the beans dry, return them to the large stockpot and set it aside. In a medium-size saucepan, heat the olive oil over medium-high heat. Add the shallots and mushrooms, and cook until the shallots are translucent and the mushrooms are fork tender (about 4 minutes). Transfer the mushrooms and shallots to a small bowl, and set it aside. To the same medium-size saucepan, add the 3 tablespoons butter and melt over medium heat. Add the flour blend, salt and pepper, and stir to combine well. The mixture will clump at first, and then smooth. This is the roux that will thicken the sauce. Cook over medium heat, stirring constantly, until the mixture has just begun to turn a very light brown color. Add the stock to the roux very slowly, stirring constantly to break up any lumps that might form. Add the evaporated milk, and continue to stir until the mixture is smooth. Bring the mixture to a simmer, and continue to cook, stirring occasionally, until reduced by about one-quarter. Remove the saucepan from the heat, and add the mushrooms and shallots. Stir to combine. Make the topping. In a small bowl, combine the bread crumbs with the melted butter, and stir to combine. Scatter the bread crumbs evenly over the top of the green bean mixture in the baking dish. Place the baking dish in the center of the preheated oven, and bake until the topping is lightly golden brown and the sauce is bubbling (about 15 minutes). Remove from the oven and top with the crushed crispy fried onions. Press the onions down gently, and serve immediately. *At this point, the dish can be cooled to room temperature, then covered tightly and stored in the refrigerator for 2 to 3 days. Before serving, just resume the recipe instructions where you left off. P.S. The Bread Memories Giveaway ends TODAY!! Enter to win most everything you need to get started on the Bread Book right away! And don’t forget the BIG & BIGGER Bread Book Giveaway—help me reach 500 book orders by 12/10/13 and maybe I’ll come bake bread with you at your house! Best. Green bean. Casserole. EVER!!! And I did use TJ’s (aka KAF) GF flour in it (and for the fried onions, and for the turkey gravy) and it worked great. Thank you so much!!! Made this today, and I just want to say… I love you. Thank you! How important is it to use super fine white rice flour? All I have is superfine brown rice flour, would this substitute work? Ok, also wondering about the evaporated milk…any non-dairy substitutes you can recommend? I’m all in for the xanthan-gum free flour now, and all the other ingredients…thanks in advance. PS. Can’t wait to get your bread book, apparently its arriving earlier than expected, yay! Is there another way to go about using a dairy free evaporated milk? Unless the canned goat milk will work? Hi, Margaret, Very important, in fact. If you try to make a roux with a flour blend that contains xanthan gum, it will be gooey and, frankly, pretty gross. You’ll be fighting the xanthan gum back the whole recipe. If you don’t want to buy the separate flours, you might try King Arthur’s gf blend as it doesn’t contain xanthan gum (although I haven’t tried it myself in this application). Holy smokes! Glad I asked. Now I understand some of my gooey (and gross) results in the past. I’m going shopping. Thank you for your guidance. Can’t wait for this new green bean casserole…and then crepes…and then….and then….Happy Thanksgiving! Just discussing making allergy-friendly swaps for Thanksgiving with a patient and came across your great recipe! Thank you for your great recipes. I love having wonderful resources like your blog to recommend to patients and clients! Me too on the pie crust..I have used the Gluten Free Pantry (Glutino) Pie crust mix. It is pretty good, but can get soggy for pumpkin pie. I would love a tried and true gluten free made-from scratch recipe. There are great recipes for crustless pumpkin pies because honestly for me, I just don’t need the extra calories and I’m not a huge crust fan. However if you are, see my notes to Mare below. It’s a good time to purchase your entire GFOAS library of cookbooks! Along with the bread book of course!! OK, Nicole – I am attempting my first ever GF apple pie this weekend (test before the big day). What recipe do I use for the crust? I believe in books 1 and 2 there are crust recipes – there might even be one on the blog and then of course there is the u-tube video on how to roll it all out. You’ll want to make sure to use the non-savory one for sweet pies. Thanks, Jennifer. I have both books. I think, though, that she has tweaked the recipe since the books. That is why I have questions. Such as do I use the BBhack for cup4cup that she created? Seeking our expert’s reply! Thanks for jumping in, Jennifer! Hi, Mare! My favorite flour for pastry is the Better Than Cup4Cup blend, so if you can use that, I would. Hacking Better Batter into Cup4Cup is also a good way to go. And as for a precise recipe, I would go with the recipe from this Sour Cherry Pie recipe for a sweet pie. And I’m scrambling to put up a Custard Pie recipe tomorrow that will also have a crust recipe. Hope that helps! Was wondering how I would make the casserole this year – now I know. My favorite recipe adds a can of drained bean sprouts. I’m sure I can add these to your recipe and be able to duplicate on if my favorite Thanksgiving recipes. Thank you. Definitely, Judy! Just be sure they’re well-drained! I do not do green bean casserole – I am a purist when it comes to green beans. I did make the crispy fried onions last night and was absolutely GIDDY while eating them with my steak. YUMMY!!! Steak with fried onions sounds amazing, Mare! Was awesome! Kids who are not GF wanted my leftovers (no, they were mine!) Now they want me to make that recipe into real onion rings. Yes – this is a wonderful recipe. Of course I have my own going since this dish is a big deal at holidays but the topping option you gave is the best one yet. I have not been able to nail it…thanks so much! Hi, Jennifer! Unfortunately, I won’t know anything about how close we are to our goal until Monday, when my publisher receives (and provides me with) a report! I promise to update as soon as I hear a peep! You’re the best! I will absolutely be sure to let you know the minute I have any numbers!! This is incredibly helpful! I was planning on using Smitten Kitchen’s recipe as a guide and attempting my own GF adjustments but I’m so happy I won’t have to. (Usually things never end well when I don’t follow recipe directions exactly!) Looking forward to the rest of your Thanksgiving recipes. The idea of following a recipe precisely is music to my ears, Meaghan! Most people don’t do that at all. :) SO glad to help make a GF T’giving a success!